Dear 3,749 people who streamed It’s the End of the World As We Know It the day of the Brexit vote, Hang in there." 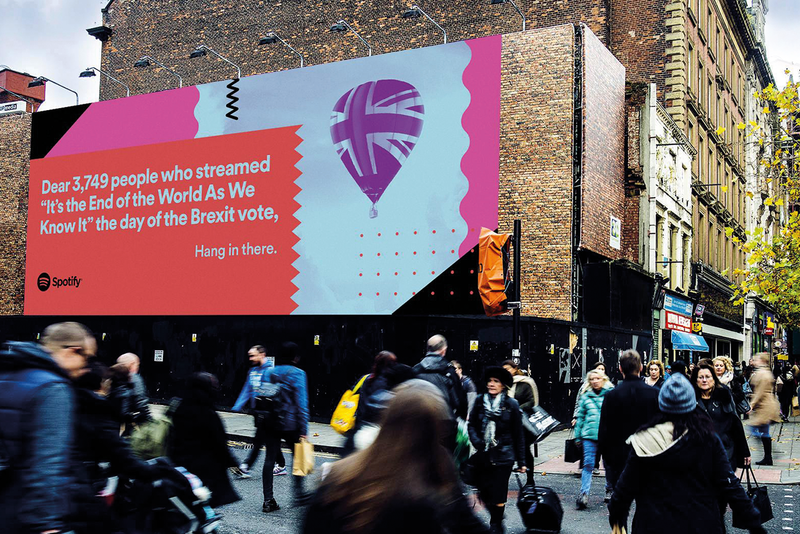 This is one of my favourite headlines from Spotify’s OOH campaign "Thanks 2016, it’s been weird". It was a year that ran away with itself. There was nothing we could do to tame it. All we could do was wallow in the music. Spotify cleverly used streaming data to bring to life some insights into our music listening habits. It picked up on the truth that not only is music a reflection of life, but so are the songs we listen to and the names we give our playlists – a good gauge of public mood. Localise this data and you’re onto a winner. Yes – data can be boring. It lumps people into categories they don’t belong in; its sweeping generalisations are infuriating. But the way the data is used for this campaign is different. This is all about pulling out our human quirks – talking about things that are relatable, rather than stereotypical. The more insights creatives have, the more witty, entertaining and effective their OOH work can be. That’s the wonderful thing about this campaign: the freshness of the insights, and the fact that it landed slap-bang in the middle of whatever we were all going through at the time. It would be really interesting to be even more reactive with this campaign in digital spaces. In 2016 we bade farewell to so many musical talents – and within minutes of the news of their death breaking, those beloved stars were propelled to the top of the streaming charts. Imagine if Spotify created these funny, relatable headlines based on that day’s news? Or if you could know how many people in your town were listening to DJ Jazzy Jeff and The Fresh Prince’s Summertime on a blazing hot day? The art direction is bright, vibrant and true to Spotify’s Swedish heritage. Clean and bold, with no need for hashtags, social media icons or calls to action, it’s OOH creativity at its best. Politics can be a dry old world – that is, until election time, when the circus well and truly comes to town. Trump and Hillary squared up and we, the world, watched as the mad reality show of the US presidential election played out in front of our eyes. It was beyond a feast for the media as it was handed characters (or caricatures) like politics had never seen before. Many brands jumped on the political bandwagon – how could they not? – when standing for something felt even more important somehow. Diesel delivered the beautiful and punchy "Make love not walls", and I absolutely loved the elegance and power of AeroMexico’s’ "Borders" campaign. Pure class. But the one that really stood out for me came from Der Tagesspiegel, a German daily paper. It’s not a regular publication for me, but it captured what I love so much about the powerful iconography that can be created in politically charged times when, in among the flurry of commentary and conversation, big, bold images can stand out above all the noise and come to define a moment in history. In case you haven’t seen it, it’s OOH at its best – simple, bold and has a major impact. a smart idea, shot well, in-camera. It creates something original by taking the familiar and twisting it, and is made for the scale, impact and immediacy of OOH, where one powerful image can tell a story better than 1,000 words ever can. We all remember Blair’s "Demon eyes" from the Conservatives’ "New Labour, new danger" campaign, and Obama’s "Hope". 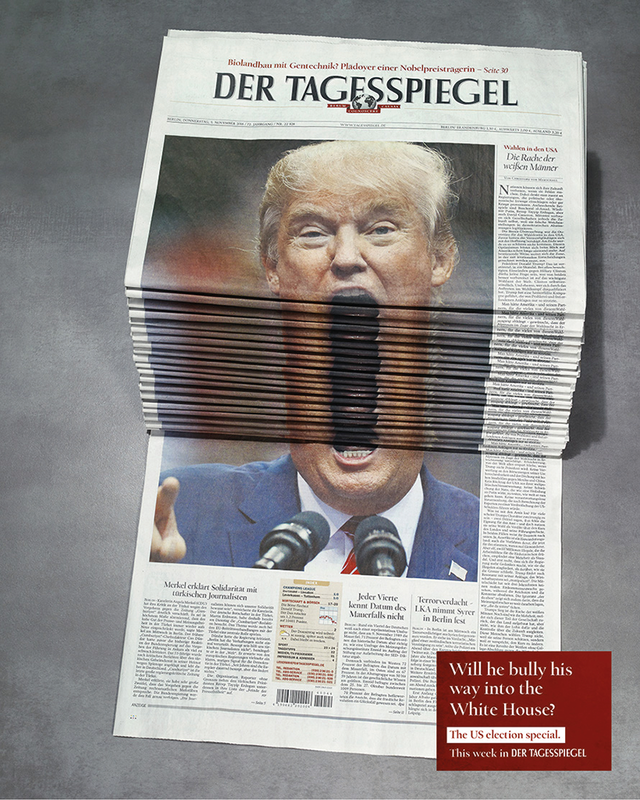 They’re brilliant, but I love that this comes from a daily newspaper in Berlin. No fuss, no big budgets, just a great idea, simply executed and on a fast turnaround. Had it been the New York Times, I’m sure it would be more widely famous, and part of the visual lexicon of this now infamous moment in history. It deserves to be. Every great joke hangs on an inherent truth. In advertising, data illuminates this truth. With the plethora of data now available, our challenge is to use it to power creativity. In OOH we can now use data to understand peoples’ specific behaviour in particular locations. OOH is a ‘one to many’ medium and that will always be its strength. We saw the power of relevancy through the Spotify campaign especially. Using dynamic ad-serving technology like our Liveposter platform, we can now optimise content in real time. Campaigns that deliver the right message, in the right place and at the right moment are up to 15% more effective. It’s these behind-the-scenes uses that really let the creative sing.